TWO.BB.CLEAN by Beautyblender. SET - Beautyblender 2 pcs + BlenderCleanser. Perfect gift idea for every fan of the iconic Beautyblender. Beautyblender sponges are perfect for applying primer, blush in cream and concealer. Created by Rea Ann Silva (top Hollywood make-up artist) to provide High Definition (HD) make-up. Soft, elastic, multi-pore structure facilitates daily make-up. In combination with fluid, it provides a silky and naturally looking complexion. During primer application it blends perfectly with the skin without creating stains or smudges. In addition, it reduces visibility of wrinkles and discolorations. The elliptical shape facilitates perfect smoothing and even coverage of all facial parts (including the eye area). It provides airbrush make-up effect. Innovative technology protects the applied cosmetics from being absorbed by the applicator. This guarantees great savings and convenience. Beautyblender does not contain latex and odor. Reusable and hypoallergenic product. 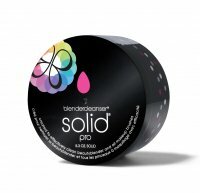 The set also includes also Blendercleanser - specially developed fluid with properties caring for beautyblender. The cleanser is based on beneficial to skin and sponge fibers soy extract. Designed to support daily care of the applicator. It removes excess foundation or concealer and all kinds of bacteria and impurities, leaving the sponge ready for next use. In addition, blendercleanser is free of artificial colors and substances that may irritate skin. It is ecological and thanks to it's high content of lavender extract with antibacterial activity it provides hygienic purity. In addition to the sponge you can also use it to clean cosmetic brushes. Set of two make-up sponges + gentle cleansing soap. For applying primer or concealer. Reduce the appearance of wrinkles and discolorations. BlenderCleanser is ecological and has a subtle lavender scent.